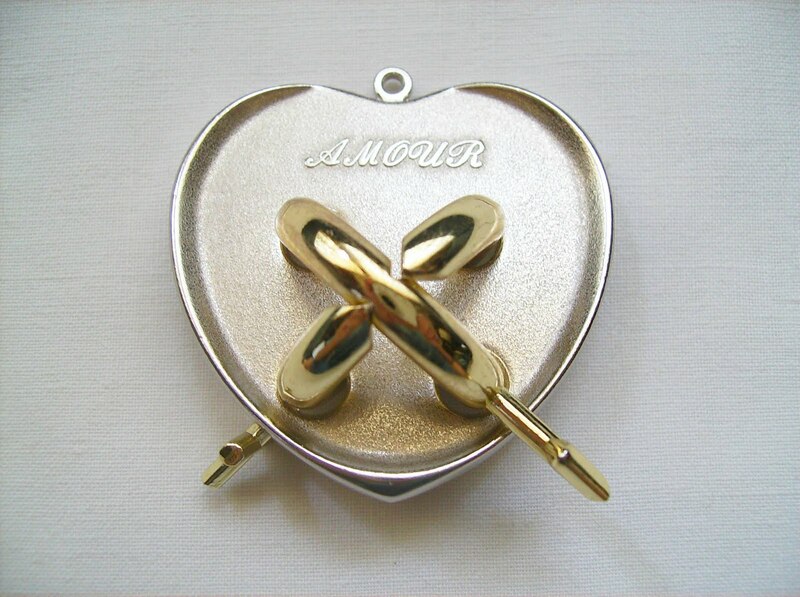 This is the Hanayama's Cast Amour, released almost 20 years ago, back in 1992 and designed by Akio Yamamoto. Back then, there wasn't so many Cast Puzzles being released like today, and between 1983, the year of the first ones and 1992, only about 9 puzzles were built, which is an average of one puzzle per year. Now you can see on average, four Cast Puzzles per year. 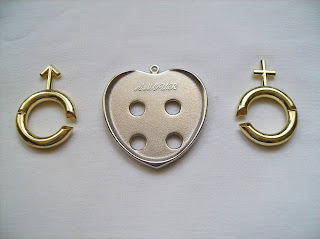 The objective of the puzzle is to remove the two golden loops, which both carry the symbols for male and female from the heart-shaped silver plate. The history behind the puzzle is to represent Adam and Eve (the male and female symbols) and the "Forbidden Fruit" (the silver apple). The difficulty is rated at 5 (out of 6) by Hanayama and 9 (out of 10) by PuzzleMaster, so it's supposed to be a very tough puzzle. I only agree in part with the ratings, because it's a two challenge puzzle, meaning that after you remove the loops, you have to place them in the same starting positions. Solving the first part isn't that hard, as your only concern is to just separate the loops from the plate, without acknowledging the steps that you're making to achieve this task. When you're trying to return the loops to their positions it's way more difficult to remember the exact way used in the process, so in this situation, I agree with a difficulty of 5 out 6. I would say that the difficulty for the first challenge could be 4, maybe a 3 depending on your puzzle solving skills. To get a solution, go here. The originality behind the concept of the Cast Amour is amazing, only possible by the genius mind of Akio Yamamoto, also designer of other Cast Puzzles like the Cast Vortex, Cast Seahorse and Cast Claw to name a few. 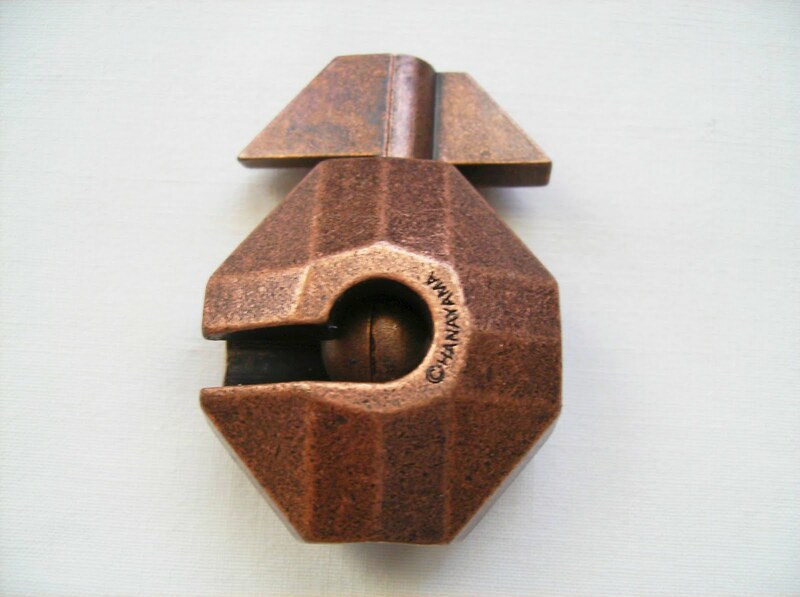 It's proof that when you have a concept for a puzzle, it doesn't only matter its functionality, but also how you present it to the general public in order to captivate their interest in an otherwise ordinary idea. 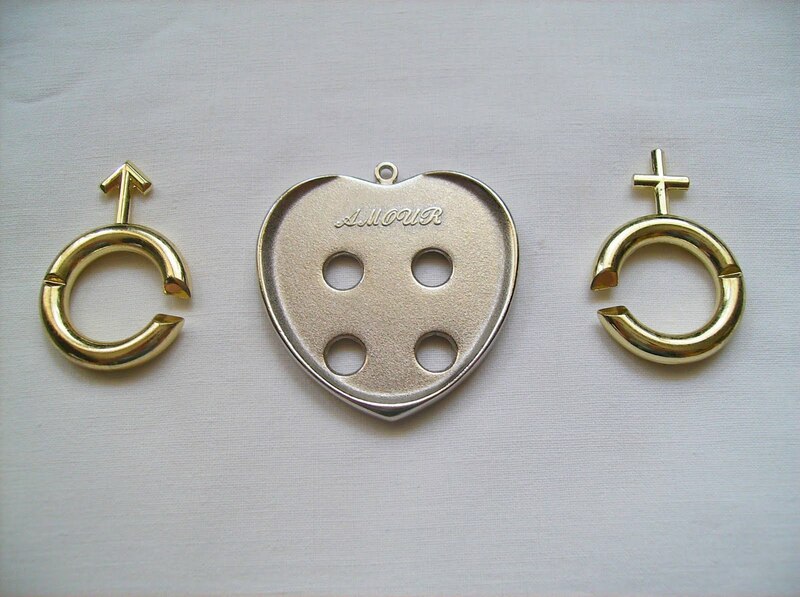 The Cast Amour can be purchased from the PuzzleMaster store at CAD $12.95. 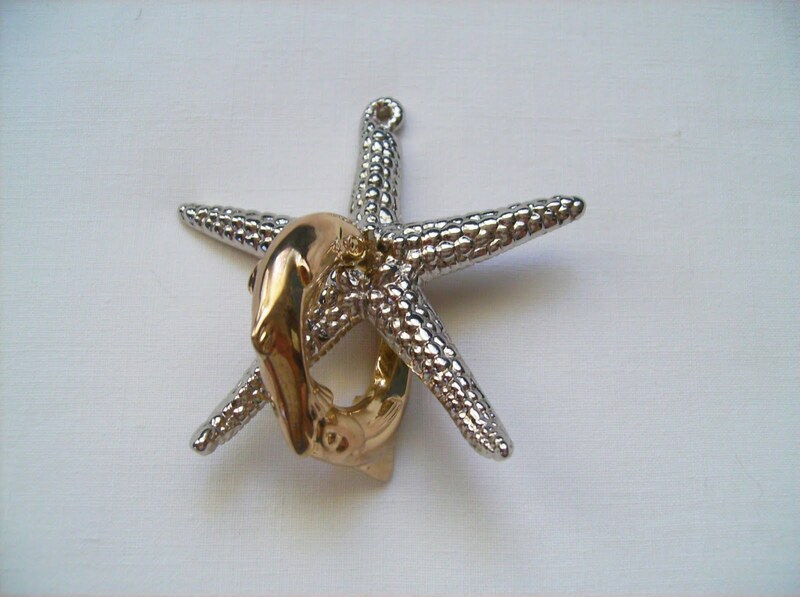 The Cast Starfish, released in 2008, belongs to the Hanayama's Marine Series, a small collection of six Cast Puzzles that have the sea and ocean as the main theme. 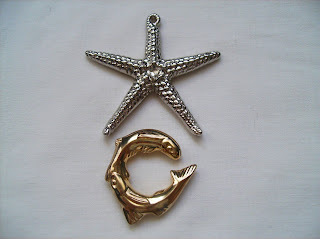 This is my favorite from the Marine Series, and one of the most beautiful in the Cast collection. It may not be the most difficult one, but it's design makes up for the lack of challenge. The goal is similar to some of the others in the series, which is to separate a couple of mackerels joined in a loop from the starfish. 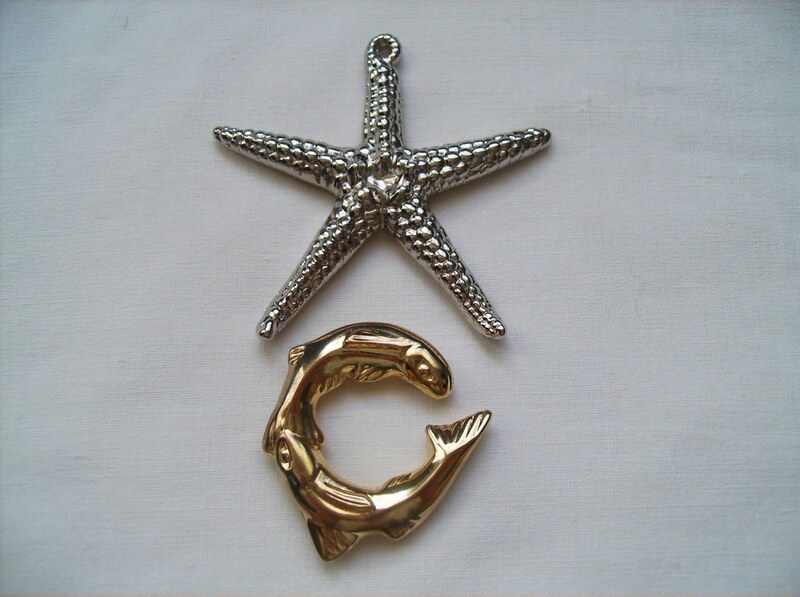 The design choice of having the two fish in a different color, in this case golden, adds a lovely touch of contrast to the silver starfish: simple, but effective. As usual, there's two level ratings, one from Hanayama (2 out of 6) and the other from PuzzleMaster (6 out 10). Since the level rating from PuzzleMaster goes from 5 to 10, they're spot on with the difficulty. The puzzle is relatively easy to solve in approximately 10 minutes or less, but not that easy, as it makes you think what route to take to separate the fish from the star. On the back of the star, there's small grooves that help to move the mackerels around. By rotating them and move through those grooves, you'll eventually free the fish. I did it by "accident", kind of... I was maneuvering the loop like stated above, and just like that, they were free... Sort of like an "a-ha moment". For a graphical solution, click here. In my collection, I only have three of the six in the Marine Series, the other two being the Cast Claw and the Cast Seahorse, but I also recommend the other three if you're one of those that likes to collect this type of puzzles. The other three are the Cast Seabream, the Cast Shark and the Cast Reef. All of these puzzles above are available at the PuzzleMaster website. Have fun collecting them and most of all, solving them. 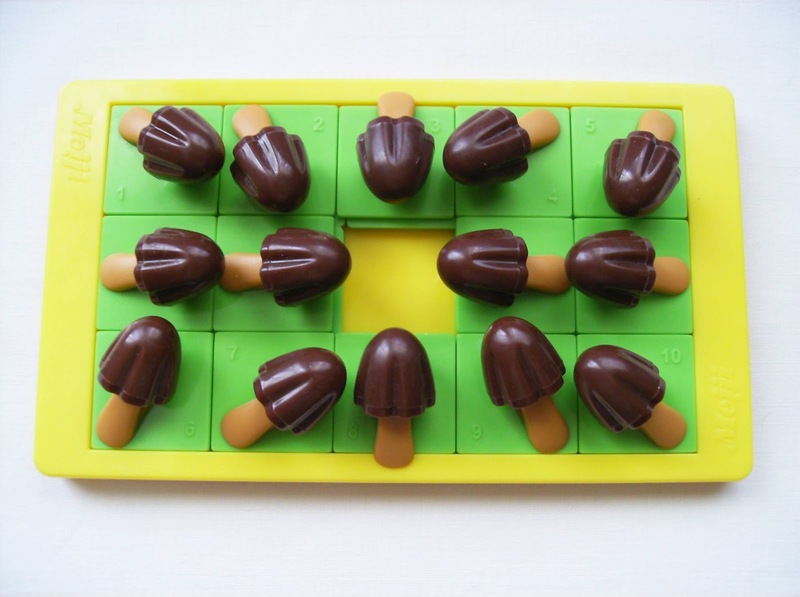 The Mushroom Mountain by Hanayama is a Slide Puzzle with an added difficulty. 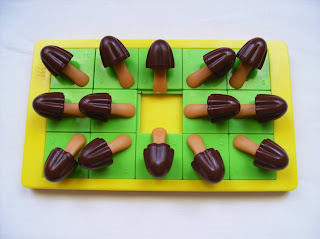 The area of the puzzle is a 3x5 rectangle with mushrooms on each sliding piece. Each piece has a different number and orientation, except for the middle four pieces, which have two for both left and right directions. When you first unpack the puzzle, you see that every piece is pointing outwards from the center, and the goal is to get all of them pointing into the opposite direction, which is to point to the middle of the board. Now, the puzzle could be much simpler if it were possible to just slide every piece to wherever you wish, but that's not the case. Some of the mushrooms will block each other's movements, because, as you can see from the pictures, they go outside the boarders of their own sliding piece and can sometimes overlap with another mushroom that's on its way. This will make many of the otherwise simple moves an impossibility, so you'll have to find an alternative route to get a specific piece to the desired place. Such movements can be sometimes, quite a pain to overcome, because as you work your way around those pieces already in the right place, you'll often find yourself forced to move them of their correct place, just to move another piece that can only pass through that path. The difficulty is rated by PuzzleMaster as a level 7 out of 10, although I found it to be more frustrating than difficult. If you're a slide puzzle wiz, you'll solve it eventually, but the bottom line is that it's not so straightforward as you'd expect a slide puzzle to be. There's many methods and techniques to solve a puzzle like this: mine was to start first with the bottom line, then get the four pieces from the right middle line and upper line in their correct order, and finally use the remaining five pieces to work as a 3x2 puzzle. The package of the puzzle comes entirely written in Japanese along with its instructions, but you can figure out what you're supposed to do by the pictures, and there's also a diagram at the bottom of the puzzle with the numbers in their correct order for both objectives. I liked the Mushroom Mountain puzzle. It's a little challenging and frustrating at times, but not so much that'll keep you from solving it. It's nice to see other original ideas used in this classic and simple concept, for a change. Highly Recommended. The Mushroom Mountain can be ordered from the PuzzleMaster website for CAD $11.99. Note: There's another version of this puzzle, also available at PuzzleMaster, called "Bamboo Shoot Village", which has bullets instead of mushrooms. The Cast Flag, an old design back from the 19th century and brought to Hanayama by NOB (Nobuyuki Yoshigahara) with this new updated version, which was released in 1994. The design is very original, (I've never seen something remotely similar before) and the object of the puzzle is to just take the flags apart. It's that simple... It's smaller than I was expecting, but heavier and sturdier though. You have the flag post, which is divided in two by rotating on its axis, and this will allow you to roam around the puzzle to remove the post, by passing it through the big opening, opposite from where you started. The solution is somewhat easy to achieve. 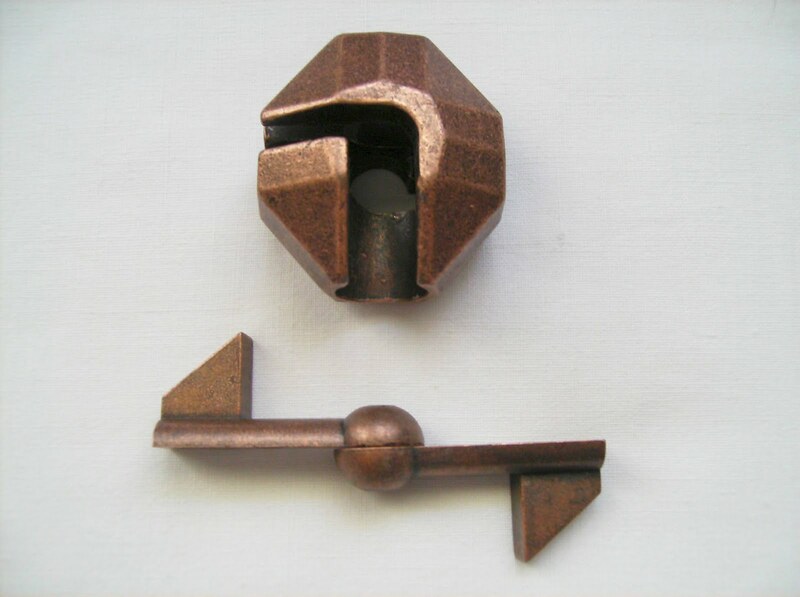 This is a level 1 puzzle from the Hanayama rating (1 through 6) and a level 5 from PuzzleMaster (5 through 10). The only part where you might get stuck a little while is to figure out the right path to the exit, which is not so straightforward. After getting the flags out, returning them to their place is about the same, because the process is easy to comprehend. You can get the solution here, if you are out of ideas. All in all, the Cast Flag is easy to pick up and solved in no time, but it feels good to play with. 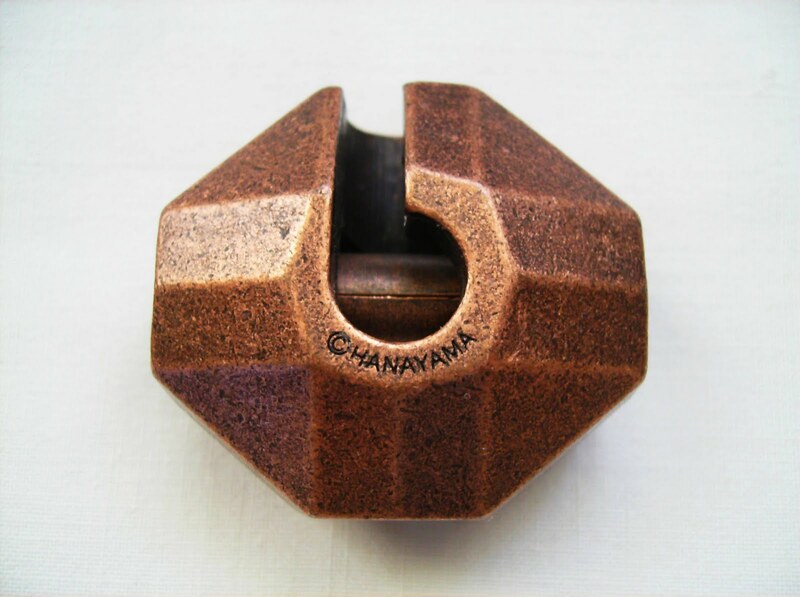 It's stress and frustration-free, although still provides a good amount of thinking, courtesy of the Hanayama minds. The good thing about the easier levels of the Cast Series is that they are easily understood by a wider audience, making them a great choice for parties, to entertain friends. You can find the Cast Flag, along with the rest of the Cast Puzzle Collection at PuzzleMaster for CAD $12.95.